Detroit, the largest city in the state of Michigan, lies on the northwest bank of the Detroit River and on Lake St. Clair, between Lakes Huron and Erie. 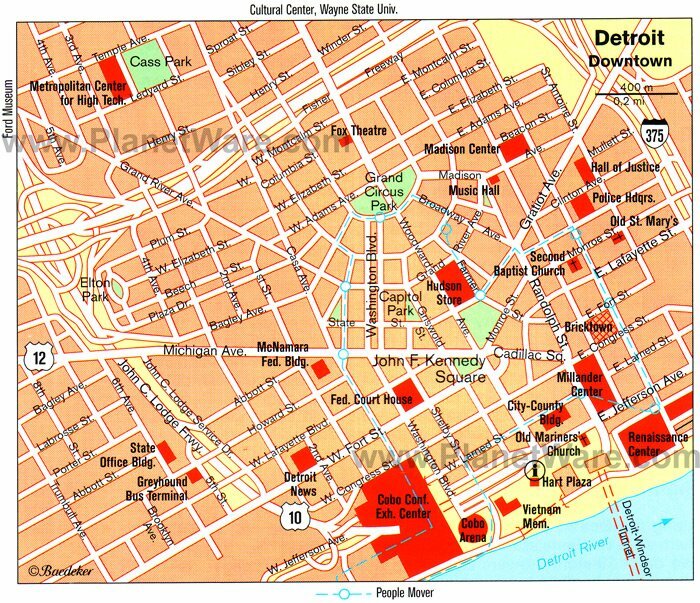 Downtown Detroit sits at the water's edge and is packed with things to do, as well as restaurants, shops, and interesting neighborhoods like Greektown. The Dearborn Neighborhood is a top sightseeing destination best known for its association with automotive legend Henry Ford, and it is also home to several ethnic neighborhoods, including an Arab-American area that has excellent Middle Eastern dining options. The suburban Oakland district is home to the Detroit Zoo and also known for its upscale cafes and shops. Outlying neighborhoods include Detroit's "East side" of Macomb, known for its marinas, and the trendy Greater Noni neighborhood, with its golf courses and recreational facilities. The Detroit Institute of Arts displays a representative cross-section of man's artistic creation from the earliest cultures to the present day. Its permanent collection includes more than 65,000 works of art within more than 100 galleries. This includes pieces from Africa, Oceania, and the Indigenous Americas; art of the Near East and classical antiquity; collections from medieval Europe; and American art and culture. Among the museum's most popular are masterpieces of European painting, including works by Rembrandt, Van Gogh (self-portrait), Matisse, and Picasso. There is also an extensive collection of Islamic art with pottery, bronze, stone, and other works that span from ancient to modern and a gallery dedicated to African American art, which includes a variety of media. In addition to traditional art forms, the museum is home to a performing arts collection that includes film and theater memorabilia, as well as the Paul McPharlin Puppetry Collection. Also referred to as "Hitsville USA" for its iconic sign, the Motown Museum is a small shingle-clad building that was occupied from 1957 to 1972 by the studio where records of the "Motown sound" were produced. Visitors can see the actual recording studio where Marvin Gaye and others produced hit songs and the apartment where Motown founder Berry Gordy Jr. lived with his family. The museum chronicles the history of the recording studio and the historic days of Detroit's rise to fame as the birthplace of some of the biggest hits of all time. Be sure to call ahead to reserve your tour - admission sells out quickly. The Ford Piquette Avenue Plant is where the Model T was born, revolutionizing the automotive industry and shaping the way for the future of personal transportation. The building is a National Historic Landmark, formerly the center of manufacturing for what was once the world's most popular car. Visitors can walk through the plant on the original worn floorboards and admire dozens of beautifully maintained early model vehicles, including Ford's cars and his competitors. You can also see the "experimental room" just as it was when Ford and his team worked on developing and testing new ideas, including a drafting table, tools, and even his mother's rocking chair. The Detroit Historical Museum is dedicated to celebrating the motor city's fascinating past, including how the city got the nickname - and the reputation - as the center of the automotive industry. Exhibits include reconstructions of old Detroit streets, model railways, and dioramas that provide a general overview of the city and the events that shaped it. Additional exhibits include details about the vital role that the city's factories and people played during World War II, Detroit's part in the Underground Railroad, and other defining features of the city. The Detroit Historical Society also operates the Dossin Great Lakes Museum on Belle Isle, which explores the city's maritime history. The Museum of African-American History illustrates the historical role of blacks in the United States and their position in the city of Detroit. Exhibits deal with a variety of topics, including a look at prominent African American scientists and technological leaders and Detroit's Underground Railroad that enabled slaves to flee from Michigan into Canada. In addition to permanent and changing exhibits, the museum hosts a wide variety of events, including lectures, discussions, and films that touch upon social, political, and other issues. Located in the Detroit suburb of Dearborn, Fair Lane is the former home of automaker Henry Ford and his wife Clara. The Fords settled into their new home in 1915 and lived there until their deaths in 1947 and 1950. The grounds of Fair Lane include a powerhouse hydropower plant, which gave the estate the independence to produce its own power, heat, and light. The estate also included a summer house, man-made lake, staff cottages, gatehouse, pony barn, skating house, greenhouse, root cellar, vegetable garden, peony gardens, a "Santa's workshop," and five hundred birdhouses. Although the property is in the process of restoration, the grounds are accessible to visitors. The grounds of Fort Wayne feature a five-pointed bastion fortress built in the 1840s, which tourists enter through the Sally Port, a fortified wooden door made with three layers of wood. Inside the fort stands the large limestone barracks building, which was constructed in 1848. Visitors can tour the first floor to get a peek at what life was like for a soldier in the 1860s. The fort's interior also includes its oldest building, the powder magazine, and the large open parade grounds. Other features include a restored officer's quarters; the Demilune, which once held the water-facing cannons; and a dry moat. The fort hosts a number of events throughout the summer, as well as several special tours, including nighttime ghost tours that explore the spookier side of the fort. Belle Isle is an island in the Detroit River, approximately three miles long and up to one mile wide, laid out with beautiful parkland, hiking trails, and sports facilities. One of the primary features is the Anna Scripps Whitcomb Conservatory, which opened in 1904 and includes palms, cacti and desert plants, tropical plants, and a lily pond. The island is also home to the Dossin Great Lakes Museum, which has numerous ship models and other exhibits illustrating the history of shipping on the Great Lakes, as well as reminders of the days of grand Great Lakes cruises, like the restored Gothic Room from the S.S. City of Detroit III. Other attractions include the Belle Isle Nature Zoo, where visitors can feed deer, and the newly remodeled Belle Isle Aquarium. There are plenty of recreational opportunities on the island, including a driving range, bicycle and boat rentals, a giant slide, and plenty of swimming holes and hiking trails in and around the park's three lakes. About 11 miles west of the city center is the suburb of Dearborn, where the automobile manufacturer Henry Ford was born. In 1929, he established two exhibition complexes as memorials to himself: the 12-acre Henry Ford Museum and an open-air museum called Greenfield Village. The Henry Ford Museum offers a general survey of the development of American life and technological advances from pioneering days to the present time. Among the most notable exhibits are George Stephenson's first steam locomotive (1829); some 200 automobiles, including the first Ford and the car in which John F. Kennedy was assassinated; and the Fokker in which Admiral Byrd made the first flight over the North Pole in 1926. Just north of the Henry Ford Museum is the entrance to Greenfield Village, an open-air museum with some 100 historic buildings of the 18th and 19th centuries from all over the United States. Among them are a school, railroad station, and other public buildings, the house in which Henry Ford was born, Edison's laboratory, and the Wright brothers' bicycle factory. The numerous shops in the Village Craft Center sell the products of the various workshops in the village. Comerica Park is a combination ballpark, theme park, and baseball museum. The park is most famous as the home of the Detroit Tigers baseball team whose history is celebrated along the main concourse in a series of exhibits that highlight the team's accomplishments and milestones, as well as a "Walk of Fame," which celebrates its most famous players. Behind first base, families can enjoy a nice ride on the carousel, while in the third-base section there is a 50-foot Ferris wheel with seats that look like giant baseballs. If you have the chance to attend a game or event at the park, you will see the famous "liquid fireworks" in action on the center-field wall, where a colorfully lit fountain punctuates home runs and wows the crowd. Along the Detroit River are huge skyscraper complexes, and dominating them all is the Renaissance Center, which poses as a central feature on the Detroit skyline. This seven-tower complex is a top sightseeing destination, housing the Detroit Marriott, offices, restaurants, and shops that are connected by a dizzying network of escalators and walkways. There is an observation deck on the 72nd floor, which offers excellent views over the city. The center's most popular attraction is the massive GM showroom, which displays the company's vehicles, including mint-condition early cars and trucks through the newest models. Pewabic Pottery was founded in 1903 by Mary Chase Perry Stratton and her partner, Horace Caulkins. The studio, operated by Stratton, continued until her death in 1961 and a few more years after that by her assistant. Today, Pewabic Pottery operates the ceramics museum, gallery workshop, and studio. The studio is a National Historic Landmark and houses an extensive collection of American ceramics in its museum. There is also a gift shop, where tourists can purchase genuine Pewabic Pottery, from large pieces to a wide variety of Michigan and Detroit souvenir pieces. The museum is free and open to the public daily. The Detroit Public Library formally opened to the public on March 25, 1865. The initial collection included 5,000 books and was located in a room in the old Capitol High School. The library moved to its present location on March 21, 1921. There are currently 10 departments within the main library and 23 branches. The building itself is the main attraction and is Listed on the National Register of Historic Places. Visitors can take a free, one-hour, docent-led tour of the building, which explores the library's architecture, art, and history. 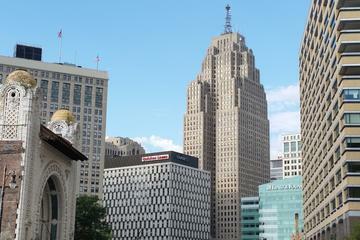 The Masonic Temple of Detroit is classical Gothic architecture built with Indiana limestone. The temple was dedicated in 1926 and is the largest temple of its kind in the world. The building has three major divisions: the ritualistic tower, the auditorium, and the Shrine Club. The facility hosts concerts and other events. Visitors who would like a tour of this impressive building need to call ahead for a reservation. Luxury Hotels: Right downtown and near a People Mover stop, the Aloft Detroit at The David Whitney is housed in a fully restored 1915 Neo-Renaissance-style building with a spectacular four-story gold leaf atrium. The MGM Grand Hotel is a huge complex, with large rooms, great views of the city skyline, and a variety of on-site entertainment options. If you are in Detroit for a sporting event, the Westin Book Cadillac is in an ideal location, with all of the major stadiums less than a 15-minute walk from this hotel. Mid-Range Hotels: For something a little different, The Inn on Ferry Street is a beautifully restored, small hotel consisting of four Victorian homes and two carriage houses. 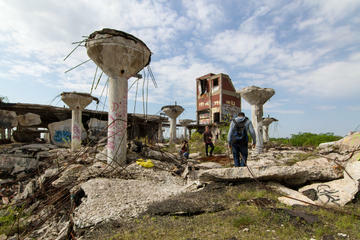 Although it is a little outside the city center, it is close to the Detroit Institute of Art. The Crowne Plaza Detroit Downtown Riverfront is a tall, sleek, modern hotel near the Riverwalk area and just minutes from the People Mover. For families, the Doubletree Detroit Downtown - Fort Shelby is a good choice, with a variety of options, including large two-room suites. Budget Hotels: The Holiday Inn Express Detroit Downtown is an upper-end budget hotel in the downtown area, with a pool on the top floor, and a complimentary breakfast. To find better value budget options it's best to head outside of the city center. The Red Roof Inn Detroit Dearborn/Greenfield Village is 12 miles from downtown but only two miles from the Henry Ford Museum. The Comfort Inn Near Greenfield Village is in the same area and features an indoor pool and a free shuttle to anywhere within five miles of the hotel.